It’s been a while since Opeth left their death metal origins behind to focus on a more melodic, late ’60s and early ’70s prog rock approach. While 2014’s Pale Communion was confirmation of this relatively new style, Sorceress brings back a few elements from their darker and heavier early 2000s approach. Perhaps what makes Sorceress so special is the blend between the latter with even more acoustic folk elements a la Jethro Tull, creating a perfect balance between harsh and melodic sounds. Sorceress starts with “Persefone,” soothing acoustic guitar introducing the album in an intriguing way. 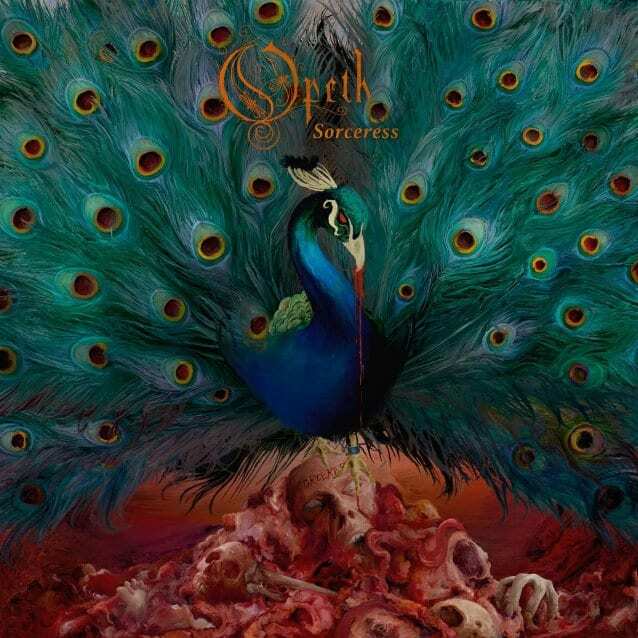 Although it’s not technically an instrumental (there are some female lyrics toward the ending), the song showcases Opeth’s instrumental musicianship with remarkable baroque guitar work. Then we come to the title track, the definite highlight of the album. It’s a Genesis-inspired tune that suddenly transforms into the heavy, distorted palm-muted chugging that most metal fans will certainly appreciate. But don’t expect growling vocals or anything like that; Mikael’s voice is as melodic as can be, even while keeping a good amount of energy and cadence. If you are a prog rock fan, you will love the odd time signature riffing towards the middle and ending. “The Wilde Flowers” is a mid-tempo, Dream Theater style song that some could consider a bit too repetitive for at least 4 minutes. But then the song morphs into a slow-tempo melodic track that could easily fit into Damnation – Opeth’s take on clean guitar-oriented album. Sorceress continues with several Jethro Tull inspired tunes, such as “Will O The Wisp,” “Sorceress 2,” and “The Seventh Sojourn,” with focus on 12-string acoustic guitar folk strumming approach. “The Ward” continues the band’s heavy focus on late ’60s prog rock, almost a tribute to early Genesis and Yes. “Chrysalis” could potentially be a new live favorite for the band’s more prog metal focused fans. It contains a pounding riffing reminiscent of early ’80s Iron Maiden without giving away the band’s organ and keyboard wizardry. “Strange Brew” and “Era” are probably the album’s most compelling and technical pieces throughout the whole listen. They shows off the band’s full musical talent, with upspeed odd time signature, fast soloing, and overall epic structure. Overall, Sorceress shows off an always evolving and musically hungry Opeth, one that won’t tire the listener with too many technicalities or lighting fast shred – a common trap for other progressive bands. It has just the perfect balance between progressive, melodic, and good taste. You can buy Sorceress on iTunes now.